I was twenty feet underground, surrounded by glowing blue sandfish crystals, with my head jammed in a beetle-vine warren, when I realized that vine-mining wasn't for me. "Parthenia will do no such thing while in my charge," Miss Wilkins said coldly. She was sitting as straight as a rod opposite Putty. "She might have been allowed to run wild while under the care of others, but I am quite a different proposition." A missing Martian. A sinister plot. A Napoleonic spy. . . Boundless adventures await in Book 2 of The Secrets of the Dragon Tomb middle grade sci-fi series! If Edward thought life was going to be easy in Lunae City, he was very, very wrong. The moment he intercepts a thief escaping from Lady Harleston’s town house, he is caught in a terrible scheme that threatens all of Mars. Soon he’s fighting off vicious sea serpents, battling a small army of heavily armored thugs, and trying to unpick an impossible mystery. Edward doesn’t know whom he can trust. Will he make the right choice? 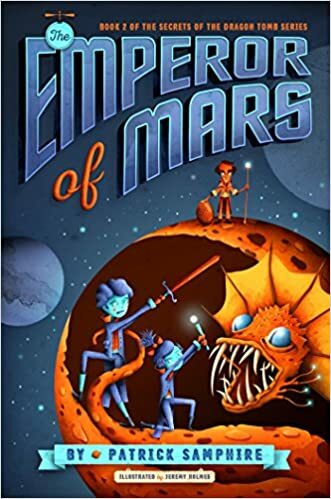 Or will his family―and his entire planet―fall victim to the treacherous Emperor of Mars? This sounds like a good one. Thanks for mentioning it, and enjoy your current read! Love that cover! Thanks for sharing! This sounds so fun and you had me with that cover! Both of the books you shared this week are now on my list!